Feeling tired is something that most women have experienced, but sometimes the feeling of fatigue is more severe than normal. It can be difficult to accomplish normal tasks or perform duties at work when you're feeling constantly sleepy and tired. Extreme fatigue is not normal, and you should investigate the causes of the condition and the possible solutions. There are many possible causes of fatigue and sleepiness, including the following. Women going through menopause experience several different changes to their body, and one of these changes can be related to sleep and wakefulness. Due to shifting levels of hormones in the body - especially a decrease in estrogen - it can be more difficult to fall asleep, and once asleep, the body may spend less time in REM, which is needed for a restful night. A very common reason for sleepiness is not getting enough sleep. As simple and obvious as that may sound, many people think they are sleeping enough when in reality their sleep quality suffers. Adults should sleep 7 - 8 hours per night, but many sleep far less. Additionally, people may suffer from sleep apnea - a breathing condition in which sleep quality is affected - without realizing. Mental illness, especially depression, is known for going hand-in-hand with fatigue. However, other psychological factors can cause fatigue as well. Excessive stress is a likely cause for fatigue and sleepiness, and even a strong emotional state such as grief has been known to cause fatigue. A disorder call chronic fatigue syndrome may be the reason for a perpetual feeling of exhaustion. Unlike normal fatigue and sleepiness, CFS will not disappear when you rest or sleep. CFS is not well-understood, but it is characterized by chronic sleepiness and fatigue, along with a few other symptoms. Allow yourself time to sleep. This may mean forgoing some TV or other activities in order to get in bed earlier, but it is crucial. Stop using screens before bed. Sleep quality can be damaged by the light from electronic devices. Work on relieving stress. Meditation or other methods can help to reduce stress, which can improve energy levels. Exercise regularly. Plenty of exercise can help you sleep better and improve your fitness level, giving you more energy. While a lack of sleep can be easy for you to diagnose yourself, other health issues that cause fatigue are more complicated, so you should visit a doctor if you think your fatigue is caused by something severe. Learn more about the different ways to manage fatigue and sleepiness with some simple lifestyle changes. Fatigue during Menstruation: What Should I Do? Menopause symptoms can be disturbing. Read over the following page for more information on of fatigue and dizziness symptoms. 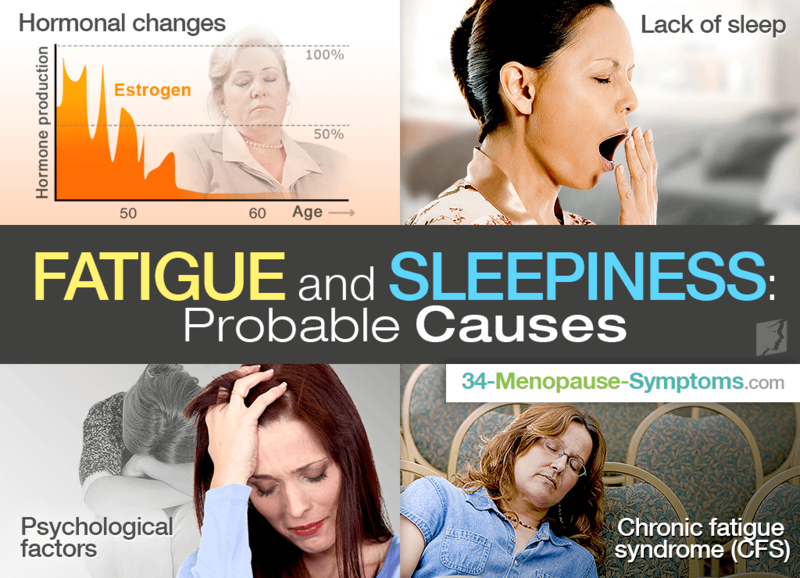 Many women feel fatigued as they progress through menopause. Women sometimes turn to herbal remedies like ginseng to manage their fatigue.